If you work with clients using Therabands, your life just got easier. Theraband's elegant resistance band dispensing system saves time, clutter and mess - no more measuring, cutting, folding, etc. Simply draw out a pre-wrapped band already cut to a convenient five foot length, swipe the UPC code, if desired, and you're done. But the Dispenser Pack is more than just convenient. It's also more sanitary than bulk bands. Using pre-packaged bands helps limit cross-contamination between sick patients who otherwise would be sharing their equipment. This can help hospitals, nursing homes, and athletic teams combat the spread of staph infections. Also important for safety, each pre-packaged band meets FDA labeling requirements for latex warnings and provides proper safety instructions to the user. Within each Pack are 30 single-color, individually wrapped 5-foot bands. Each pre-wrapped band comes with a latex warning, bar code, and safety instructions sheet. An insert, written in English, Spanish and French, refers patients to free, printable, on-line exercises for various applications. 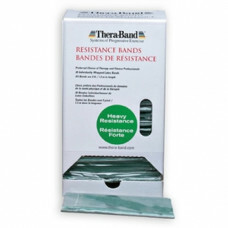 Dispenser Packs are available in the universally recognized TheraBand colors of yellow, red, green, blue, and black, the five most widely used TheraBand resistance bands. They make it easy for healthcare professionals to sell bands to clients for at-home exercise use. Box Contents: 30 pre-wrapped TheraBand latex resistance bands cut to 5-ft lengths. One color per box; specify when ordering.